Every fishermen’s dream….WATERFRONT GULF ACCESS HOME with TWO REMOTE CONTROLLED BOAT LIFTS!!! Double dock with one 10,000 lb lift and one with 7,500 lb. NEW Boat Canopy in 2018! Underwater fish light to watch giant fish swim right up to your docks. COMPOSITE DECKING for easy maintenance. Inside is gorgeous too!! !… TRAVERTINE flooring in almost every room. Large Great Room with tray ceiling has views of the water. Formal Dining Room and Den. Huge kitchen with center island. Split floor plan offers two bedrooms on one side of home and master bedroom on the other for the utmost privacy. Imagine floating the day away in your HEATED POOL with a SALT WATER SYSTEM. 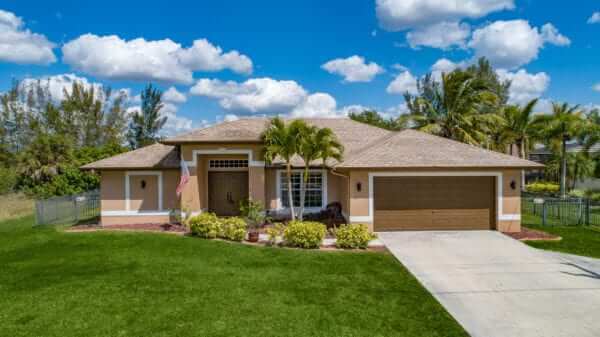 Nicely landscaped with attractive aluminum FENCE, palm trees and water pond. WHOLE HOUSE R/O system. Only one bridge to go under for great Boating access to the Gulf of Mexico, beaches, and surrounding islands such as Cayo Costa, Cabbage Key, Sanibel, Boca Grand and more. Not to mention…this area offers some of the best fishing to be found anywhere in the world. Close to shopping, restaurants. golf, etc… Fort Myers International airport about 30 miles away and Punta Gorda airport approx 20 miles away. LOCATION! LOCATION! LOCATION! 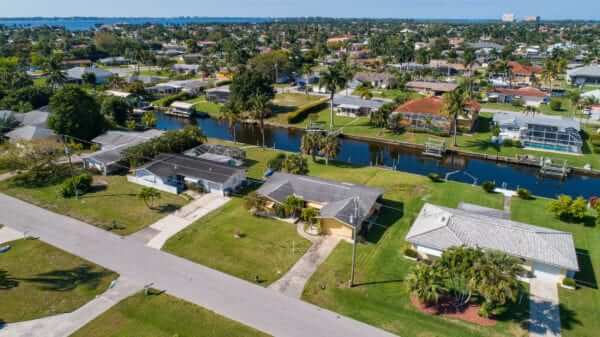 Spectacular waterfront DIRECT BOATING ACCESS TO THE GULF OF MEXICO from this Yacht Club area home. NO BRIDGE! Located just around the corner from the Bimini Basin. This diamond in the rough is priced right & just waiting for your TLC. City water/sewer in & ASSESSMENTS PAID! Attached garage. Dock with pilings & electric make installing a lift that much easier. Nice long backyard. Outside patio seating area & a generous screened lanai area. En suite master bathroom also has access to the backyard. Looks like plenty of room for a pool. Terrazzo floors. H/W heater new in 2017. Storm shutters for lanai sliders & awning-type shutters on several windows. Well-manicured lawn & landscape. SW exposure offers beautiful sunsets in Paradise. Boating access to the Gulf of Mexico, beaches, and surrounding islands such as Cayo Costa, Cabbage Key, Sanibel, Boca Grand, etc. Located close to the up and coming DOWNTOWN area with popular restaurants & activities. And the YACHT CLUB BEACH, YACHT CLUB and Boathouse Tiki Bar just a little over a mile away. Quick access to the Fort Myers Int’l airport only about 18 miles away. 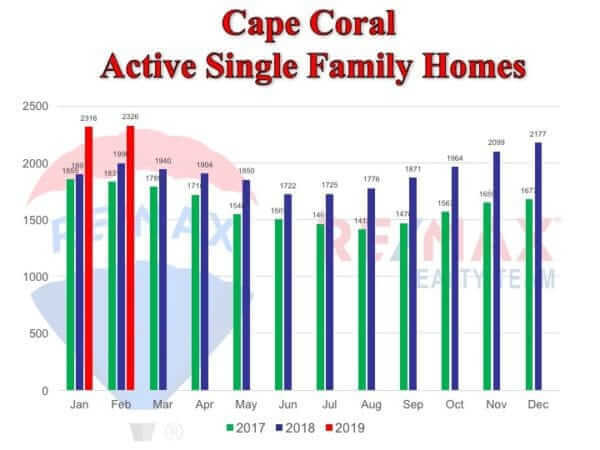 The active single family home inventory is on the rise again, with a total of 2,326 homes on the market, this is the highest Cape Coral has seen in over 8 years, including when the majority were distressed properties. 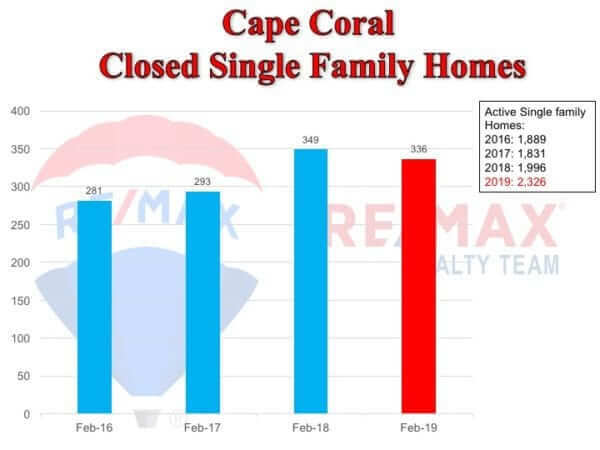 The rise in single family homes has kept Cape Coral favoring a buyer’s market but buyers beware, it’s not by much. Levels are very close to a level playing field and list to sale ratios continue at 97%. Single family home sales fell from last year by less than 4%. Home sales did rise from January by 25%. Sales totaled 336 in February. A whopping 15% drop in new construction permits from a year ago. This drop signifies a second consecutive month of declining new construction permits and measures the strength or weakness of a market. Although inventory levels were insignificant last month, sales plummeted by 13% to 230. This drop in sales indicates a two month consecutive drop. Prices appreciated by nearly 4% from a year ago to $331,000, while inventory and sales go hand in hand, prices tend to lag by a month or two. New construction permits rose to 168 nearly a 50% increase in two years. 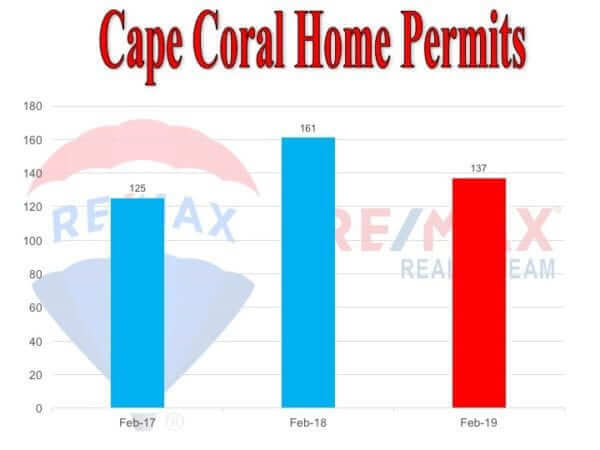 Of all Lee County residential lot sales, Cape Coral remains at the top with nearly half!.